You have a superstar here in terms of nutritional support. Each capsule is packed with high-potency acai berry powder and extracts, plus moringa, beetroot, resveratrol, grape seed extract and pomegranate. A powerful defense of the body against diseases and fatigue. Acai Berry as a supplement is superior by itself alone. Add to it Moringa oleifera, the ‘tree of life’, and you have a superstar in nutritional support. This dietary supplement also contains extracts of other superior antioxidants sources – moringa oleifera, beetroot, resveratrol, grape seed extract and pomegranate. In this new formula, we have also added zinc, biotin and Vitamin B6 which have been scientifically proven to support normal metabolism and immune defense. This health supplement provides you with a broad spectrum of vitamins, minerals, and phyto-nutrients, as well as high levels of antioxidants. By taking a capsule or two each day as part of your diet, you are able to benefit from the goodness of these berries and leafy green. Acai berry and moringa supplies the body with vitamins, minerals, fiber and other nutrients during periods of low calorie diets and reduced foods choice. So even if you do not eat full meals, you will not feel hungry. High levels of anthocyanins and the strong antioxidant vitamins in acai berry fruit and moringa promotes slowing down of the aging process. Moringa is great for the skin. It helps reduce fine lines and wrinkles. Acai berry has 15-20 times the antioxidants (anthocyanins) that red grapes have and twice as many as blue berries have. It’s a near perfect protein, and has a huge amount of dietary fiber. It is also a highly nutritious fruit. Moringa, pomegranate and beetroot are also nutrient-rich, containing several essential vitamins, minerals and amino acids. Acai berry gives strong heart health benefits. Acai berry is known to be a rich source of compounds called anthocyanins. These anthocyanins are the same compounds thought to give red wine its health benefits, but acai berries may contain even higher concentrations of these healthy chemicals than wine, with none of the health risks associated with alcohol. Acai berry is completely natural and safe for anyone to eat. Acai berry is one of the top 10 superfoods in the world. Moringa with its iron content helps fight malnutrition. 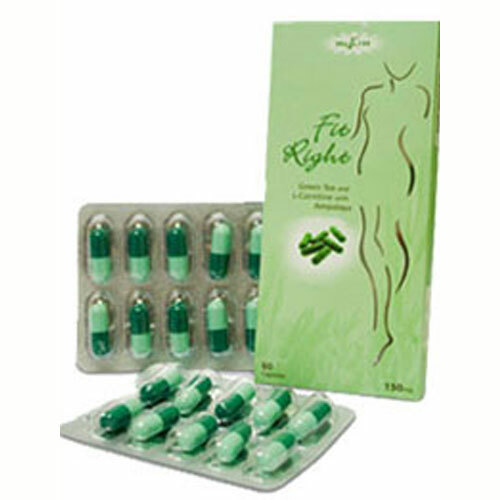 Due to it’s high fiber content, diabetics and the weight conscious gets a fuller feeling. This enables them to avoid indulging in forbidden, high sugar foods. Helps to boost energy during intense workouts and stressful jobs. Moringa is a herbal medicine. It is anti-inflammatory. It is rich in calcium, phosphorous and potassium, hence, a great aid for people with arthritis. It heals ulcers and is anti-cancer. For the other health benefits, check out this article about Moringa. If you have health issues, give this dietary superstar a try. 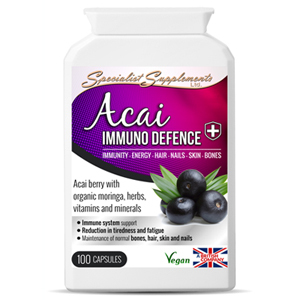 Acai Berry with Moringa Immune Defense is a product of the UK. 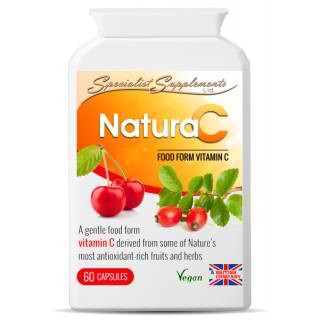 Contains no added: artificial colours, flavourings, preservatives, dairy products, gluten, lactose, soya, sugar, wheat or yeast. Suitable for vegetarians and vegans. Take a capsule 1 - 3 times per day, with or without food, depending on health condition, strenuous activity or as advised by health practitioner. Be the first to review “Acai Berry with Moringa” Click here to cancel reply.